The cocoa palm tree is a less common spelling for the coconut palm (cocus nucifera) or coco palm as a shortened version. The palm tree distinguishes itself as one of the most important of the palm species from an economical point of view. 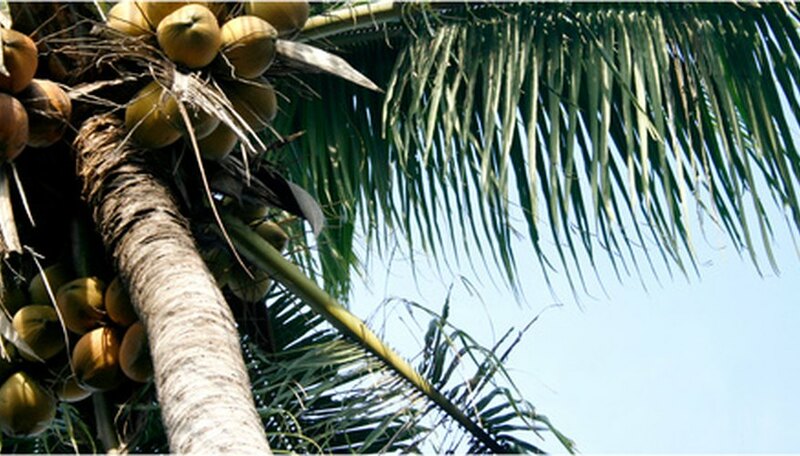 The large fruit it produces, the coconut, is sought after because of its flavorful properties. Consumers can also make use of the oil in the coconut for cooking. Like many palms, the coconut palm grows from a single stem, which is often very smooth to the look and the touch. The palm tree grows to a height of up to 60 feet within the first 20 years of its life (see reference 1). The 20-year mark is also the time at which the tree reaches its full fruit production. The palm is considered somewhat drought tolerant as well, and is located mainly in tropical and subtropical regions. Though the coconut palm is grown in the United States, it is mainly restricted to the states of Florida and Hawaii. The palm tree is not extremely cold tolerant and can be threatened when temperatures get below freezing. Though younger trees can be protected with mounds and lights, mature trees are often left to the elements. Proper fertilization can help more mature trees survive colder temperatures. Though some palms may thrive in partially-shaded conditions. the cocoa palm is not one of those. These trees require full sunlight in order to fully fruit. Therefore, you should plant trees at least 18 to 30 feet apart. The summer months tend to be the best time to plant cocoa palms because it is warmer and wetter. The cocoa palm trees are salt tolerant, but do not require a salty soil so do not have to be planted near the ocean. These trees are also remarkably adaptable to a variety of soil pH levels, able to live in anything between a 4.0 and 8.0. Thus, they are one of the more versatile trees in terms of soil acidity. The soil may need extra nutrients in the form of a time-released fertilizer every two to three months. The coconut itself is a larger nut with a fibrous husk. Inside the husk is a white fleshy area, and some amount of liquid. The more mature the nut, the less liquid is inside the hollow area. Trees produce approximately 50 to 200 nuts per year during the peak production years. The crop can be an important cash crop to some in tropical countries. The most significant problem with cocoa palm trees is lethal yellowing. This disease starts as a yellowing of the bottom palm fronds and eventually works its way toward the top of the tree. The crown may even fall off completely. Death of the tree usually happens within six months of the onset of symptoms. The most commonly-prescribed treatment is an antibiotic injected into the trunk. What are the Palm Tree Types in Central Florida?